Where to Grow Woody Bioenergy Crops? The study identifies opportunity zones for woody bioenergy crops. Photo by David Stephens, courtesy of Bugwood.org. Demand for bioenergy is expected to grow – as much as 10 times larger than present. Woody crops such as poplar or loblolly pine have the potential to fuel this growth. But where should such crops be planted? How to minimize transportation costs? Where are the opportunity zones? Where are the risks? USDA Forest Service scientist James Perdue and University of Tennessee professor Timothy Young began investigating such questions more than a decade ago, along with John Stanturf. After a long Forest Service research career, Stanturf is now at Estonian University of Life Sciences. By 2007, the three scientists were part of a research collaborative devoted to building Biomass Site Assessment Tools. BioSAT is a decision-making tool, data delivery system, research database, and more. BioSAT uses information about biomass supply, transportation networks, existing demand, policies, and landscape and site conditions. So far, BioSAT research has led to the publication of nine papers that address multiple facets of the emerging biobased economy. 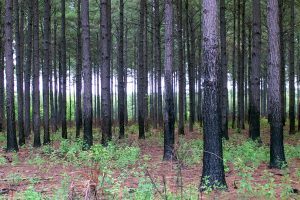 The team recently published two papers on the profitability of woody bioenergy crops in the eastern U.S. One paper, published in the journal Forest Policy and Economics, focuses on loblolly pine (Pinus taeda). 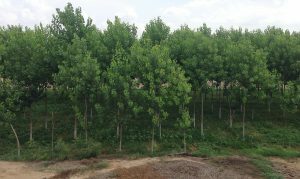 The second paper focuses on Eastern cottonwood and poplar hybrids (Populus spp.). It was published in the journal Forest Science. A related study on two eucalyptus species is also underway. “We looked at these four species because they were targeted by the Billion-Ton Report,” says Perdue. “They’re all fast-growing species, so they can be grown on short rotations.” Short-rotation woody crops (SRWC) can provide ecosystem services while they grow, as previous research has shown. But that might not be enough to make them feasible for bioenergy. “Bioenergy crops need to be profitable for everybody in the supply chain – the people who grow it, move it, and utilize it,” says Perdue. Transportation delay times had significant influences on trucking costs by state. Previous research has shown that transportation delays can increase trucking costs by as much as 61 percent. With BioSAT, Perdue and his colleagues considered transportation costs as well as average total costs, marginal cost, and information about the species and the site. Site conditions, especially soil types, have huge impacts on yields. Using the process-based growth model 3PG, they found that loblolly pine as a bioenergy crop would potentially be most profitable in parts of Alabama, Florida, Georgia, and South Carolina. The research results are available at fine spatial scales. BioSAT uses five-digit zip code tabulation areas (ZCTA), geographic areas tied to zip codes. The scientists evaluated loblolly profitability across 13 states, and poplar (cottonwood and hybrid poplar) profitability across 33 states. Woody crops can provide ecosystem services while they grow. Photo by vikas bishnoi, Wikimedia Commons. The most profitable regions for growing hybrid poplars included southern Illinois, Indiana, and central Missouri. Eastern cottonwood crops were potentially profitable in 29 percent of the ZCTAs in the South. Cottonwood yields were low in Arkansas, Kentucky, North Carolina, Oklahoma, Tennessee, and Virginia, as well as coastal regions of Alabama, Georgia, Mississippi, and South Carolina. The potential profitability zones could be useful to landowners who want to grow woody bioenergy crops, as well as industries deciding where to build biomass conversion facilities. Knowing where these species profitably could be grown would also be useful in evaluating potential effects on biodiversity and water resources. Read the full text of the Populus spp. study. Read the full text of the Loblolly study. For more information, email James Perdue at jperdue@fs.fed.us.